On the US Federal Lotus Elise / Exige, replacing the clutch, throwout bearing , flywheel, or pressure plate requires you separate the transmission from the engine. This is no small job as you have to remove suspension componants, and drop the engine down to get enough room for the transmission to come out from around the rear subframe. The job takes about 12 hours for first timers, maybe less if you have some help and have done one or two before. This job sounds like a big pain, but honestly it's one of the most fun wrenching session's I've had in a while. The car is generally a joy to work on. Even with 100k miles, every bolt was trouble free. The 2ZZ-GE and the mated C64 transmission (C60 in the Toyota Celica GTS) are pretty commonly built and assembled. If you've ever done a clutch before, there won't be very many surprises here. Optionally use or rent an engine hoist. My throwout bearing and or clutch fork had been making noise the entire time I've owned the car. All of a sudden the throwout bearing started to embarrassingly squeal in neutral with my foot off the clutch. By modulating the clutch petal I could get the screeching to stop. Eventually this turned into a constant whirring noise when the clutch was depressed, ending with noticeable vibration in the pedal and sometimes notchy clutch petal movement (resulting it strange clutch engagement behavior). Mine turned out to be a bad throwout bearing as expected. There are several options for positioning the Elise to change the clutch. 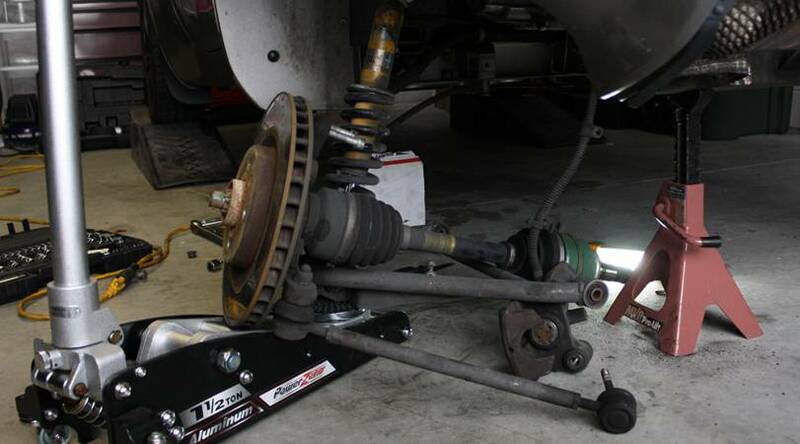 You will need to gain enough space to remove the transmission from the bottom of the car by using a lift or jack stands. To give myself enough room under the car, I put the front wheels up on ramps, and jacked up the rear of the car using a single jack and two jack stands. Using this method, the car was level when in the air. You'll need to disconnect the battery to prevent any surprises. To gain extra space, remove the engine cover or deck lid. Place a towel at the front edge, between the hinges, to protect the paint when you remove the 4 x 10mm hex screws. You may also need to disconnect any prop rod you have connected. 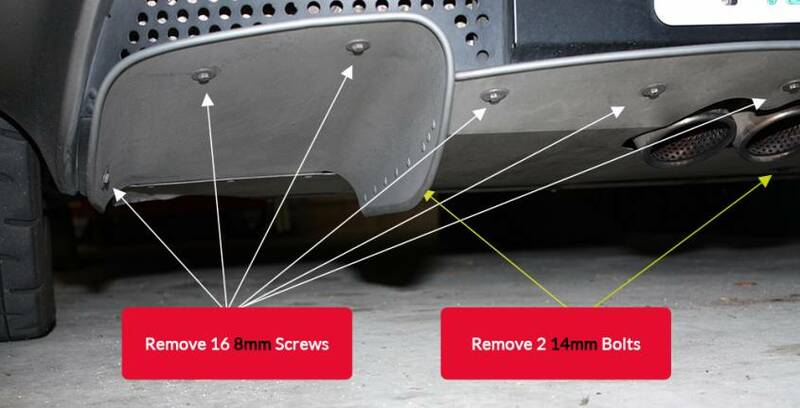 The diffuser has 16 x 8mm hex screws and 2 x 13mm hex screws holding it to the bottom of the car. I use a power tool to remove all the little screws, it'll take no time at all. The belly pan shares 5 hex screws with the diffuser, but it has an additional 6 x 8mm hex screws at each side of the car, and 2 x 5mm allen screws near the center of the car. While the car is still on the ground, loosen the 4 lugs on each of the rear wheels. No need to remove them now. Loosen them just enough so that you'll be able to remove them once the wheels are free to spin in the air. The rear of the car is easiest to jack from the crossmember just behind the engine. I very carefully placed my jack in the exact center of the crossmember, and began to slowly jack the car up. Be extremely cautious that the car doesn't slip, or roll at all. Using wheel chalks on the front wheels would be a good idea. Place jackstands at each end of the crossmember, near the diffuser screw holes. I placed my small jack stands at their maximum height minus one notch, it was plenty to get the trans out. Now with the car in the air, remove the 4 lugs from each wheel and place them aside. Drain the trans oil using the 24mm drain bolt located on the bottom driver's side of the transmission. Fully re-install and tighten the drain when finished. 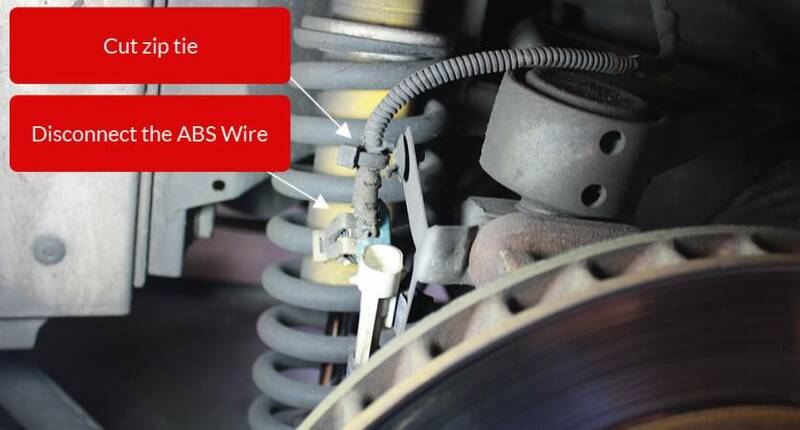 Disconnect the ABS wire, and clip the zip tie for the section that connects to the car. 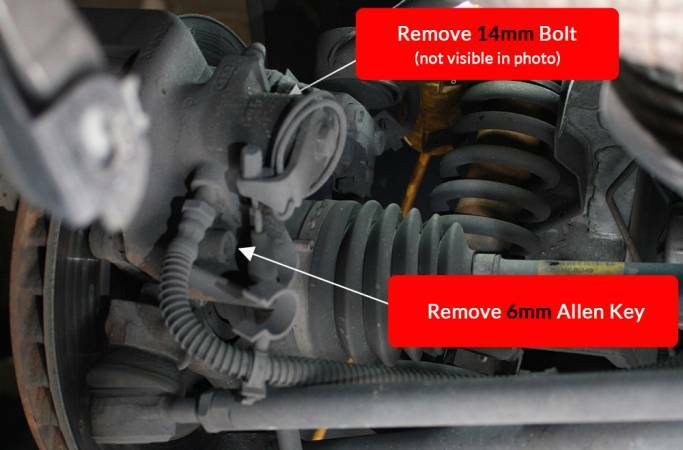 Remove the parking brake return spring. It isn't under a great deal of tension, using a pair of pliers, you should be able to grab one of the ends and pull it around the arm or caliper. 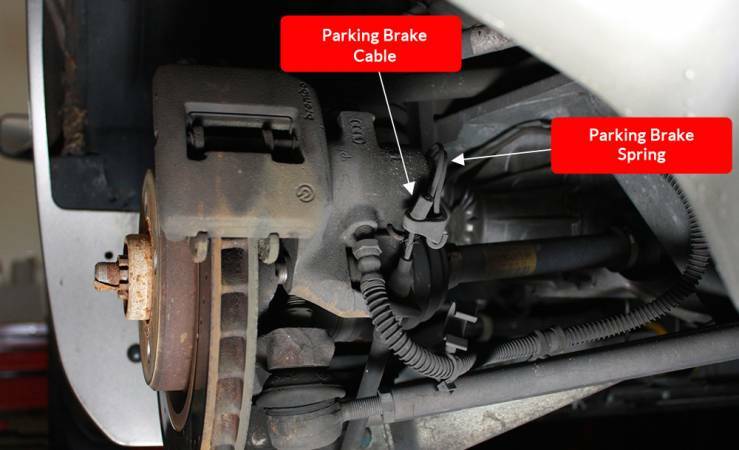 Remove the parking brake cable from the rear caliper. With the spring out of the way, the cable should be able to slip through the arm using a pair of pliers. Pull the cable back out of the caliper and lower control arm too. Remove the caliper by unbolting it from the hub. There is 1 x 17mm hex bolt on top, and 1 x 6mm allen bolt on the bottom. 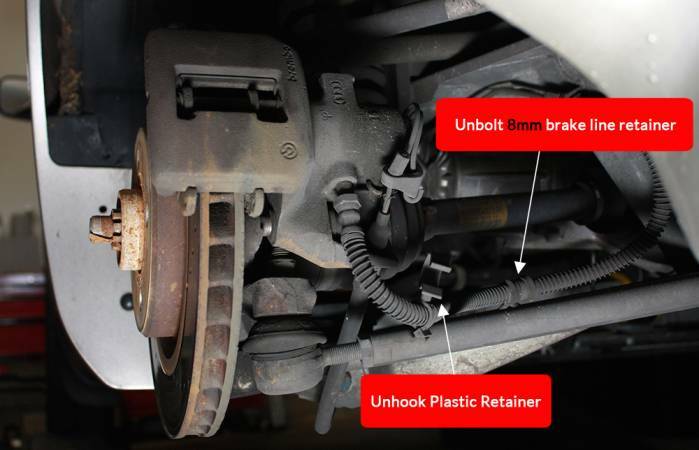 If you cannot get the caliper off because the pads will not back off enough to squeeze past the rotors, remove the brake pad retainer pin by pushing it toward the outside of the car. 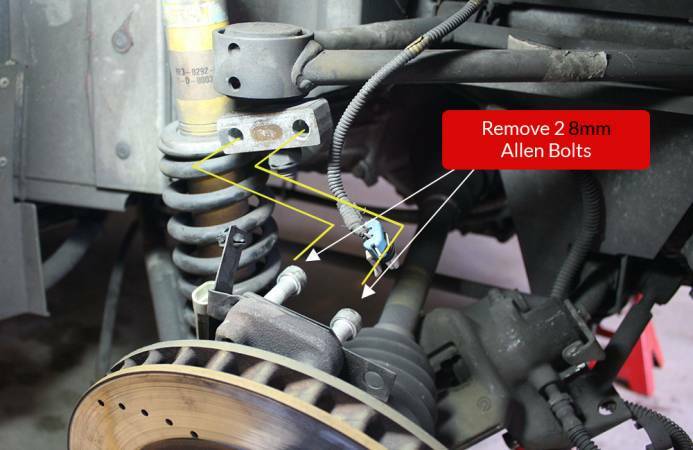 Once the caliper is free of the hub, remove the brake line retainer attaching it to the lower control arm, and let the caliper hang to the ground. Remove the upper shock bolt. It's a 17mm hex bolt. The spring was not under any tension on my car, you can test this by pushing up/down on the lower a arm to see just how much force it is exerting on the suspension. Remove the 2 x 8mm allen screws that connect the upper a-arm to the hub. The alignment shims and abs wire bracket are sandwiched between the hub and the a-arm. Take care to note their position and quantity for reassembly. Supporting the lower a-arm with a jack will make removing these two bolts easier. To gain access to the tie-rod (aka tow-link) bolts, the exhaust heat shield will need to be moved slightly. 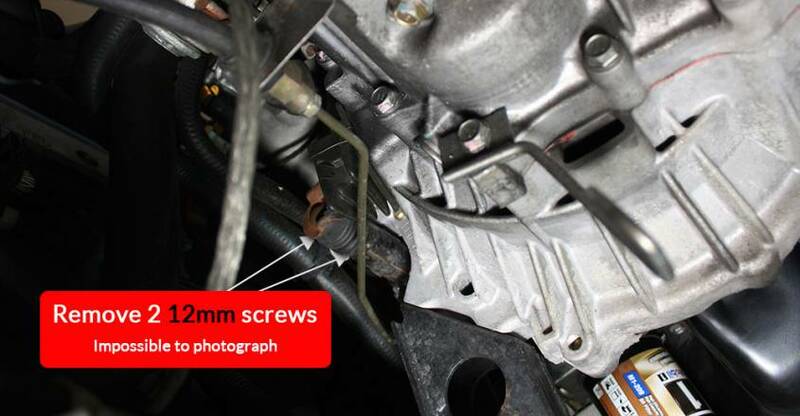 Near each inner tie-rod bolt at the subframe crossmember, there is a single 8mm hex screw that holds the heat shield in place where we need to gain a little space. 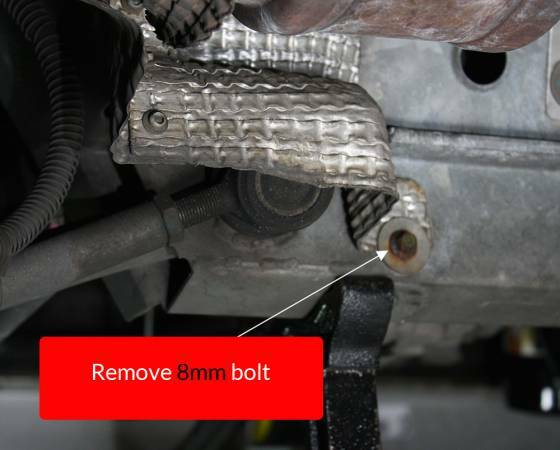 Remove it and gently pull the heat shield up enough so that the tie-rod's bolt will have space to slide out of the subframe. 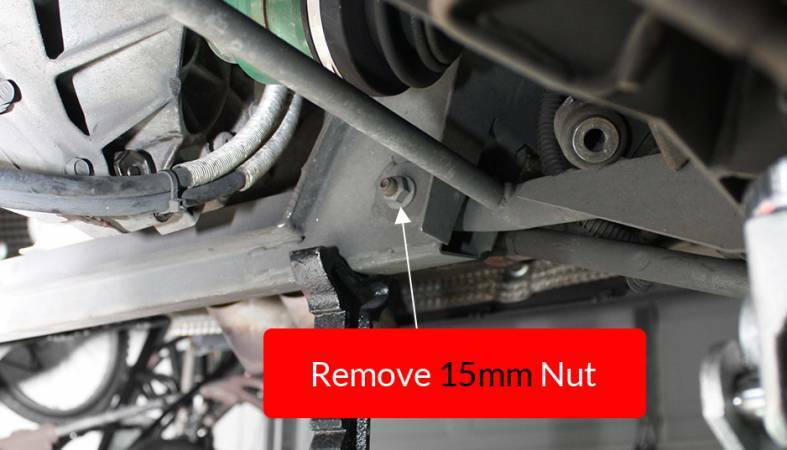 Remove the 1 x 15mm hex nut from the tie-rod end located on the front side of the rear subframe. Slide the tie-rod end out of the rear subframe. This should allow plenty of room to pop out the axle as the hub will now rotate if needed. The driver's side axle has a circlip inside the transmission that makes it difficult to remove. You will need to overcome this clip by using a slide hammer or a large pry bar. Generally the slide hammer will make the job a little easier, but I was able to pry mine out after a few tries. Pry agains the large solid green surface (not the thinner dust cap). The best approach is to push the axle all the way into the trans, and quickly and strongly pry out with a jolt. It only needs to pop out about an inch - past the circlip. Unbolt the remaining bolt from the lower a-arm. It's a 17mm hex screw. You'll have to unbend the safety clip. The a-arm, axle, and brake disc, and hub should now be completely disconnected from the frame. With the hub supported by a jack, pull the lower a-arm out of the frame and move it aside. 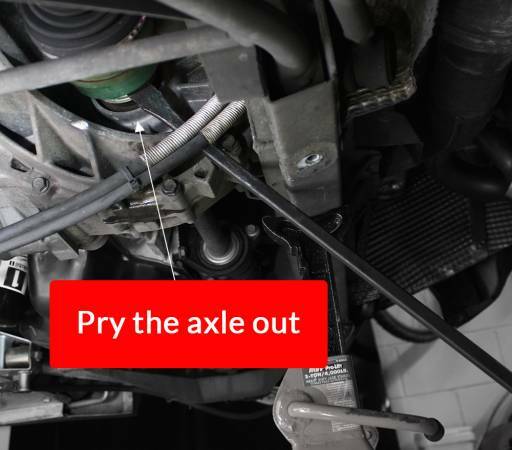 Remove the tie-rod from the passenger side just as you did for the other side. This will give us just enough clearance to pop the axle out of the transmission. Remove the 2 bolts that holds the axle carrier to the carrier bracket. 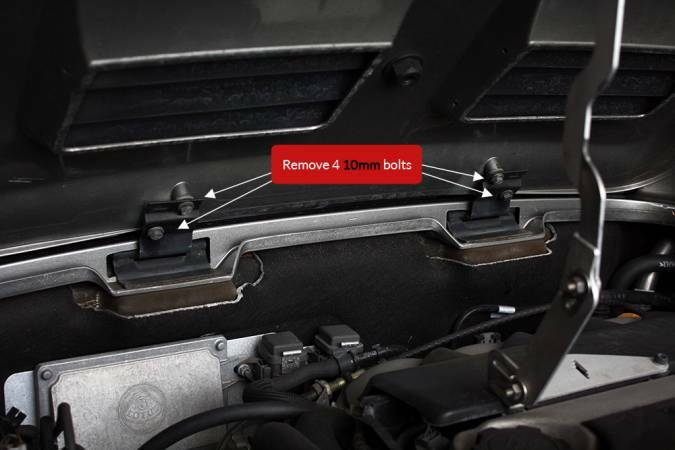 Separate the carrier from the bracket to gain access to the 3 bolts that hold the bracket on the engine block. 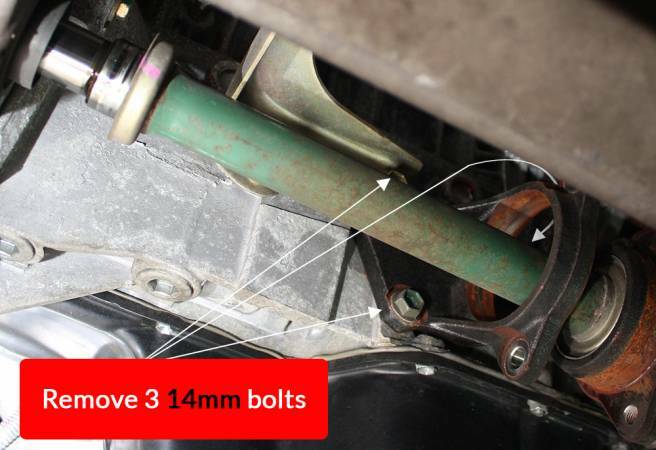 You should now be able to get the axle to contort just enough to clear the transmission. Be careful not to damage the rubber seal at the trans. Also be careful not to over-extend the joints on the axle. To get mine out, I had to angle the hub forward, pull the lower a-arm out a tad, and angle the axle upward. This gave me just enough clearance to set the axle aside. Once the axle is free, simply bungie it to the rear cross member. It can stay in the car, but you don't wont the joints over-extending or getting in the way. I slid the carrier bracket off the end, and wrapped a bungie cord around it. Remove the rear engine mount heat shield. It's held on with 2 x 8mm hex screws. 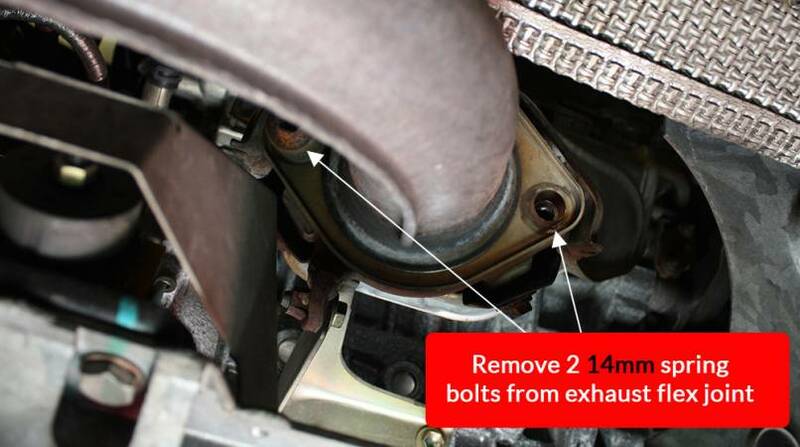 remove the 2 x 14mm spring bolts from the flex joint on the exhaust. Careful as you remove the second one, the entire exhaust may rotate so that it smacks you in the head. Hold onto it as you remove the last bolt. The rubber intake tube is held in place with 2 x 8mm hex screw clamps. To fee the tube, you may have to gently pry it from the throttle body and intake box. Loosen it from a couple different spots and you should be able to twist it out. On the front bottom side of the transmission, there is a braided ground cable that bolts onto the transmission. 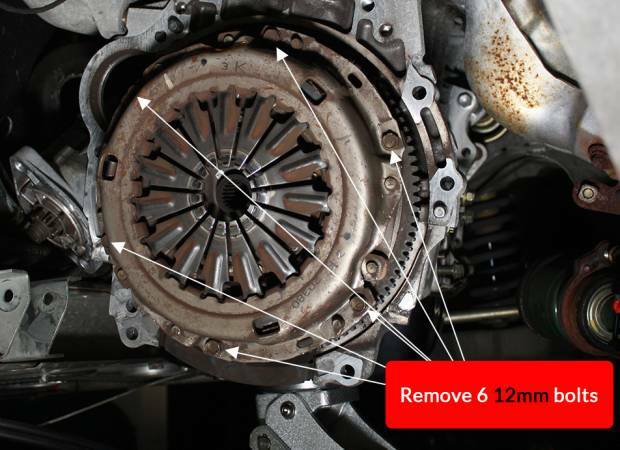 Remove it by unscrewing the 17mm hex screw that holds in in place on the transmission. 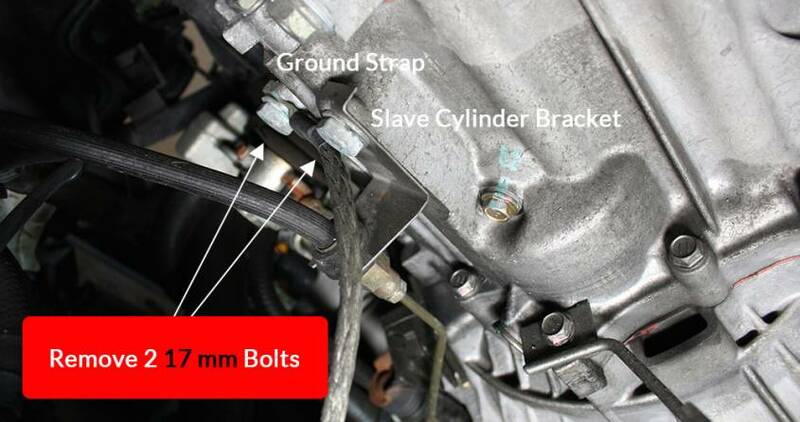 The slave cylinder has a bracket right next to the braided ground you just removed. Unbolt the bracket's 17mm hex screw. Then remove the slave cylinder itself by unbolting the 2 x 12mm bolts that hold it onto the transmission. They are difficult to see, as they are oriented at an upward, forward facing angle toward the firewall. 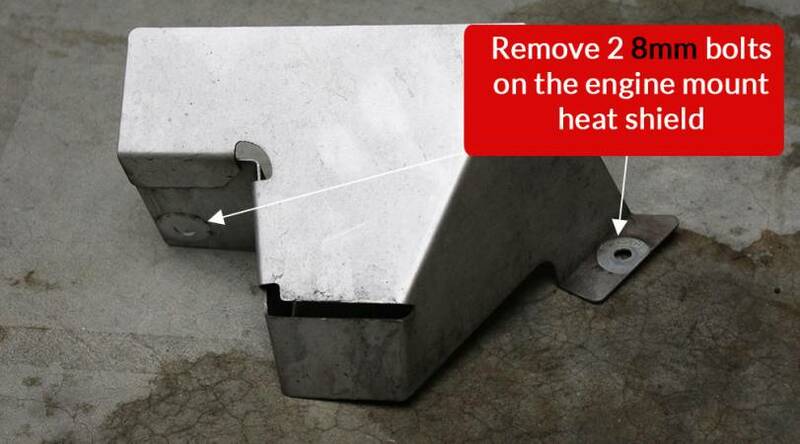 Be careful not to extend or damage the cylinder at all. Once it's free just curl it up and set aside. I was able to stuff mine into the free space under the intake box. The shift cables are easy to remove, but difficult to access. Start by pulling out the c clips on each cable that hold them in place in bracket at the top rear of the trans. Then remove the cater pin from the end of each cable. I used a flat head screwdriver to pry them loose with a magnet in the other hand to capture the pin. The ends of the cables should now slip off the shifting arms, and out of the brackets. Carefully guide them down around the bottom of the transmission so they are sticking out the back of the car. Remove the hook like bracket that holds them in place on the bottom of the trans. I also removed the small flat bracket that holds them in place under the sheer panel. This may not be necessary, but I wanted them completely out of the way. The bracket uses 2 x 8mm hex nuts. Finish up by removing the gold colored bracket that used the c clips to hold the shifter cables at the top of the transmission. It uses 2 x 14mm hex bolts. The starter is held in with 2 x 14mm hex bolts that also hold the transmission in place. One is accesible from the bottom of the car; from front side of the motor under the intake manifold. The other is on is accesible from top of the motor under the throttle body. The top one will require a wobble socket and extension to reach. Now's a good time to break the 6 remaining transmission bolts free. Don't remove them completely now, just get them loose enough that you won't need a breaker bar later. There are 2 on the top, 2 on the bottom, and 2 on the rear side. The 2 on the rear probably require removing the exhaust header support bracket which uses 3 x 14mm hex bolts. We are going to remove the front and rear mounts, keeping both side mounts in place for now. Go ahead and remove the big center 17mm bolts from both the rear and front mounts. Completely remove the rear mount. It's held onto the frame with 4 bolts, 2 x 13mm bolts and 2 x 17mm hex bolts (with 15mm nuts). Now remove the rear mount that bolts into the transmission. There are 2 x 14mm hex bolts keeping it in place. The front mount is in a much tighter space. You may need to get creative with your tools to remove the mount from the transmission. The reverse switch is on the top rear of the trans, accessible from the top. Squeeze the clip with your fingers and pull. Now that everything is out of the way, you'll be tilting the whole motor down on the driver's side. You need to make sure we don't over-extend any cables or wires. I disconnected the plastic lines from the charcoal canister (lightly squeeze and pull). I also clipped a few zip ties retaining a wire that runs from the gas filler area to the motor. Double check to make sure there's nothing left connected to the transmission except the motor and your two remaining side motor mounts. Figure out how you're going to support the motor and transmission separately. You could use an engine hoist for the motor, and a jack for the trans. I used a jack for the motor, placing the foot under the oil pan on the middle lump thats slightly higher then the drain plug. Some people caution against this method as it may put undue stress on the pan, and pan seal. I was very cautious to monitor the pan and my jack to make sure it wasn't denting the pan as I put weight on it. It was fine in the trials, but it did eventually cause a little bit of marring by the time I was done. Nothing that will cause a problem though. I also used a motorcycle jack under the transmission. It wasn't perfect, but it was better then teetering it on a normal jack. 2 people are better then one when it comes to moving the trans around under the car. Jack up the engine so that it just barely moves upward. Place your transmission jack under the trans. We placed ours under the drain plug. 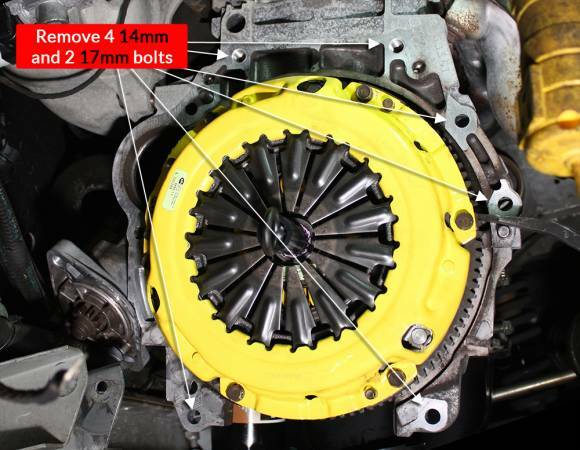 Remove the driver's side motor mount pin once you know the engine and transmission are fully supported by the jacks. Slowly lower both jacks until the transmission will fully clear the frame. The transmission will need a couple inches of movement away from the engine to disengage the clutch. 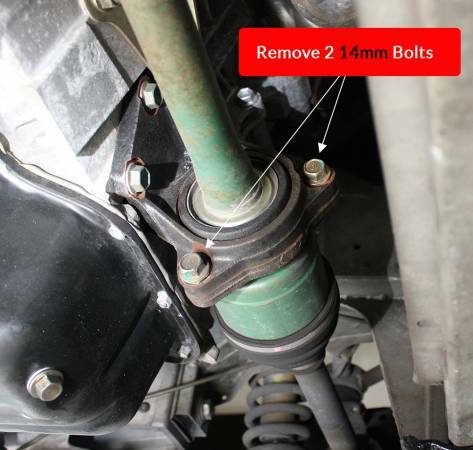 You may choose to remove the driver's side mount bracket from the transmission if needed to clear the subframe. Once you have both engine and transmission supported and the transmission is at a height where you think it will have enough space, begin unbolting the 6 remaining trans bolts that you loosened earlier. Start at the bottom and work your way around to the top. The trans will most likely still be held in place by a few dowl pins, so it wont just fall off. With all the bolts out, and again both the engine and trans are independently supported, then you can begin to pull and wiggle the transmission away from the engine. Go slow and be persistant. I'll slide off. Once it's loose, and the spline'd shaft is pulled far enough out to clear the pressure plate, lower the trans jack and roll it out from under the car. Take a break, grab a beer, go tell your unimpressed significant other about your accomplishments. There are 6 x 12mm hex screws around the circumference of pressure plate. Remove them. Then gently pry the pressure plate off the flywheel a little at a time near each of the remaining alignment pins. The clutch disc is free floating inside, so be careful not to let it drop when the pressure plate finally comes loose. The throwout bearing (aka release bearing) is held onto the clutch fork with a simple spring clip. Use a set of pliers to pull the spring from the clutch fork and slide the bearing off the splined shaft. Pull out the rubber dust boot and pull the clutch fork off the pivot pin. It's held on to the pin by a spring clip on the back side of the fork. Clean out everything. You don't plan on being in here again for a while, so make sure it's good to go for another 100,000 miles. The throwout bearing slides back and forth on the center shaft. To make sure it doesn't get caught up on the shaft, make sure it is nice and smooth. I actually sanded it smooth with 1000 grit paper to remove any nicks that could catch. 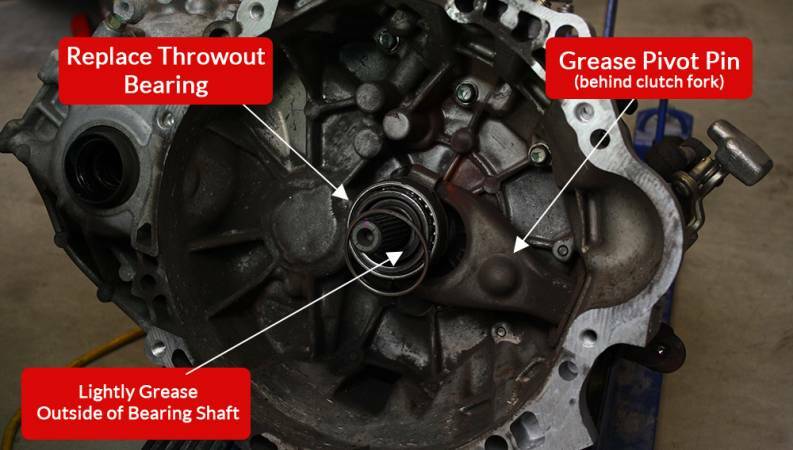 Apply a sparing amount of grease to the inner shaft that the throwout bearing slides on. Not too much, you don't want to chance any of it ending up in the clutch assembly. Apply some grease to the clutch fork pivot ball. This can help to prevent some vibrational noise and keep things working well. The clutch alignment tool usually fits into the pilot bearing which resides in the crank shaft. Since the Toyota transmission doesn't use a pilot bearing, most clutch kits come with a plastic bushing so that the alignment tool will still work. Once the clutch is installed, it cannot be removed and some are concerned about leaving plastic in the engine here. Many people use the tool and leave it in and no one reported any issues, so I just left it in. My ACT clutch came packaged with a tiny amount of lubricant to use on the transmission splines that go into the friction disc. Sparingly apply this lubricant to the splines. Place the friction disc in the pressure plate. The friction disc is not bi-directional, make sure it is in correctly. My ACT clutch (as with most I've seen) have the springs facing the pressure plate. Align the pressure plate on the dowl pins, loosely install a bolt to hold it in place. Use the friction plate alignment tool to make sure it is centered inside the pressure plate. This is important because the pressure plate will grab the clutch disc preventing it from moving. If the friction disc is not aligned it will make installing the transmission super difficult. Install all 6 of your NEW pressure plate bolts (oem bolts are not reusable). Use red Locktite on these bolts. Torque them to 15 lb.-ft. in a diagonal pattern like you would with wheel lugs. Slip the spring clips on the throwout bearing back onto the clutch fork. Slide the whole assembly back onto the shaft and snap the clutch fork back onto the pivot pin. For me, this is the hardest part of the whole job. It's much easier with 2 people as it's difficult to use your strength to maneuver the trans under the car. Place the trans back under the car, on top of your jack of choice. Jack it up and re-align it with the motor. To get the splines into the clutch disc, you'll have to wiggle and possibly rotate a tiny bit. It can be super frustrating. The keys are to have the spines lined up as much as possible, so make sure the transmission is at the same angle it would be when it's bolted up. When the trans is flat up agains the dowl pins, you should be good to begin installing the bolts by hand. Be careful here to not cross thread or force any bolts in. Get a few to thread in, and slowly begin tightening them a little at a time, switching from one bolt to another. Tighten them enough to pull the trans all the way together with the engine. Jack up the motor carefully, stopping regularly to make sure that it clears everything. Once it's up install the driver's side motor mount so that you can remove your jacks. I use a small screw driver to align the mount with the holes in the mount bracket, as it does have some give in it. First start by torquing all the transmission to engine bolts. The top two are 64 Nm, rear two 37 Nm, bottom two 23 Nm. Starter. both bolts are tightened to 37 Nm. Clutch slave cylinder. This can be pretty annoying because it's under a little pressure. I saw someone else switch these bolts to studs so that its easier to install. Make sure you grease the contact area between the pin and the clutch fork now to quiet it down a little. Braided grounding cable and bracket that holds the slave cylinder hard line. Front and rear motor mounts. Shifter cables, bracket, and hanger that mounts to the bottom or the transmission. Also re-install the bracket that holds them in place under the sheer panel if you removed it earlier. Passenger side axle, carrier, and bracket. Passenger side toe link and the little bolt that holds the exhaust heat shield near it. Rear engine mount heat shield. Rear tie rod ends are torqued to 44 lb.-ft. Note that they ball joint side has a slotted design that sinks into the hardened insert in the subframe to keep it from turning. Driver's side hub, re-installing the alignment shims in the same location. Driver's side caliper, parking brake cable, and spring. The caliper bolts are tightened to 45 Nm for the top one, and 26 Nm for the bottom. Use Locktite on both bolts. Plug in the ABS connector. Re-install any clips and zip ties that had to be removed for the driver's side suspension. Re-attach the charcoal canister line. Re-install any zip ties cut to free up the wire near the charcoal lines. The transmission takes approx 2.4 liters of oil 75W-90. There are two ways to fill the trans on the elise. The fill hole is difficult to fill, requiring a pump. However the trans has a speedometer fitting just on the top side above where the passenger axle goes in. Remove the fill plug, and pour the oil in using the speedometer fitting. Stop when it pours out the fill plug. Lower the car off the jackstands.